The World Tamil Conference is a series of occasional conferences to discuss the social growth of the Tamil language. Each conference is attended by thousands of Tamil enthusiasts around the world. Conferences are hosted in various cities in India, as well as world cities with a significant Tamil population. The conference aims in promoting the heritage of Tamil language. Sirima Ratwatte Dias Bandaranaike, commonly known as Sirimavo Bandaranaike, was a Sri Lankan stateswoman. She became the world's first non-hereditary female head of government in modern history, when she was elected Prime Minister of Sri Lanka in 1960. She served three terms: 1960–1965, 1970–1977 and 1994–2000. The Sinhalese are an Indo-Aryan ethnic group native to the island of Sri Lanka. They constitute about 75% of the Sri Lankan population and number greater than 16.2 million. The Sinhalese identity is based on language, historical heritage and religion. 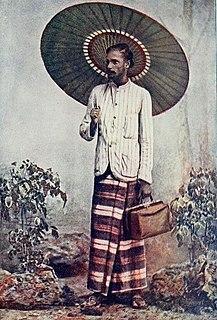 The Sinhalese people speak the Sinhalese language, an Indo-Aryan language, and are predominantly Theravada Buddhists, although a small percentage of Sinhalese follow branches of Christianity. 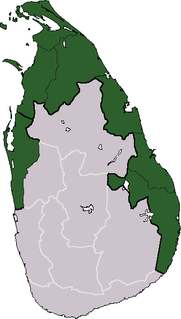 The Sinhalese are mostly found in North Central, Central, South, and West Sri Lanka. According to the 5th century epic poem Mahavamsa, and the Dipavamsa, a 3rd–5th century treatise written in Pali by Buddhist monks of the Anuradhapura Maha Viharaya in Sri Lanka, the Sinhalese are descendants of settlers who came to the island in 543 BCE from Sinhapura, in India, led by Prince Vijaya. “ "The irresistible conclusion we come to is that the police on this night (10 January 1974) was guilty of a violent and quite an unnecessary attack on unarmed citizens. Black July is the common name used to refer to the anti-Tamil pogrom and riots in Sri Lanka during July 1983. The riots began as a response to a deadly ambush on 23 July 1983 by the LTTE, one of the many Tamil militant groups of that time. The LTTE had killed 13 Sri Lanka Army soldiers in the ambush. As a reaction, on the night of 24 July 1983, anti-Tamil pogroms started rioting from the capital city of Colombo and then spread to other parts of the country. Over seven days, mobs attacked, burned, looted, and killed Tamil targets. Estimates of the death toll range between 400 and 3,000 and 150,000 people became homeless. Around 8,000 homes and 5,000 shops were destroyed. The economic cost of the riots was $300 million. A wave of Sri Lankan Tamils fled to other countries in the ensuing years and a large number of Tamil youth joined militant groups. Vinayagamoorthy Muralitharan is a Sri Lankan politician and former militant. After fighting for the Liberation Tigers of Tamil Eelam for over 20 years, he rose to prominence as the leader of the Tamil Makkal Viduthalai Pulikal (TMVP), a breakaway faction of the LTTE. The Navaly Church bombing was the bombing of the Church of Saint Peter and Saint Paul in Navaly in the Jaffna peninsula by the Sri Lankan Air Force during the Sri Lankan Civil War. It is estimated that at least 125 civilians, who had taken refuge from the fighting inside the church, died as a result of this incident. The victims included men, women and children. The expulsion of the Muslims from the Northern province was an act of ethnic cleansing carried out by the Tamil militant Liberation Tigers of Tamil Eelam (LTTE) organisation in October 1990. Due to increasing tensions between the Muslims (Moors) and Tamils in the North Sri Lanka and the Muslim opposition to the creation of a Tamil homeland, the LTTE forcibly expelled the 72,000 strong Muslim population from the Northern Province. Jeyaraj Fernandopulle was a Sri Lankan politician who served as a cabinet Minister and a Member of Parliament in Sri Lanka. He was a Roman Catholic and hailed from a minority ethnic group Colombo Chetties. Eelam War II is the name given to the second phase of armed conflict between Sri Lankan military and the separatist Liberation Tigers of Tamil Eelam. The war started after the failure of peace talks between the Premadasa government and the LTTE. This phase of the war was initiated by the LTTE who massacred almost 600 sinhalese and Muslim police personnel after they were ordered by the Premadasa government to surrender to the LTTE. The truce was broken on June 10, 1990 when the LTTE in October expelled all the 28,000 Muslims residing in Jaffna. The Long Range Reconnaissance Patrol (LRRP) is a covert operation unit of the Sri Lanka Army. This unit is also known as the Deep Penetration Unit (DPU) and as the Mahasohon Brigade. Colonel Raj Vijayasiri of the Special Forces is credited as the main figure who introduced the DPU concept and the Mahasohon Brigade to the Special Forces. LRRP units carry out the most complex and dangerous military operations of Sri Lanka. In the recent Sri Lankan Civil War, LRRP units have been successful in assassinating several high-level commanders of the LTTE in LTTE-held territory. The unit has also been accused of launching attacks on and killing civilians. The LRRP suffered a setback when a safehouse was raided by the police; they arrested several personnel along with weapons. Before the misunderstanding was later cleared out and the arrested released, the names of the personnel involved in the unit were released to the public media, resulting in the assassination of several of them. The LRRP was later reformed and has resumed its activities following the resumption of hostilities after a ceasefire between the government and the LTTE was cancelled. 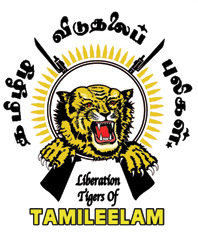 Suicide Bombing was a popular tactic of the Liberation Tigers of Tamil Eelam. According to Jane's Information Group, between 1980 and 2000, the LTTE carried out 168 suicide attacks causing heavy damage on civilian, economic and military targets. The following lists events that happened during 1990 in Sri Lanka.